The citrus spritzer is a new favorite kitchen gadget. It’s really handy in our kitchen because we use lemons, oranges, and limes often on salads and fish dishes, and it’s perfect for packed lunches and picnics. Our newest favorite way to use the citrus spritzer, however, is in applying lemon juice to the skin to treat skin pigmentation caused by sun spots, age spots, and hormone reactions. Instead of slicing lemons and placing them on the skin which requires 20-30 minutes of downtime, now we just mist the skin and when it dries mist again. 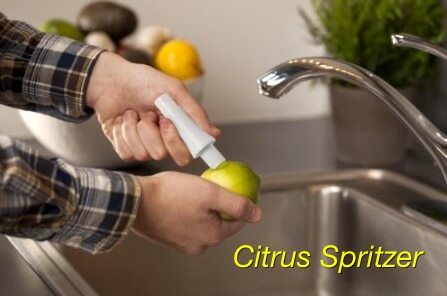 We purchased our citrus spritzer from Amazon for $5, but they can be found in many stores that sell kitchen gadgets. We’ve had no complaints with the spritzer, but do recommend that you clean it immediately after each use.